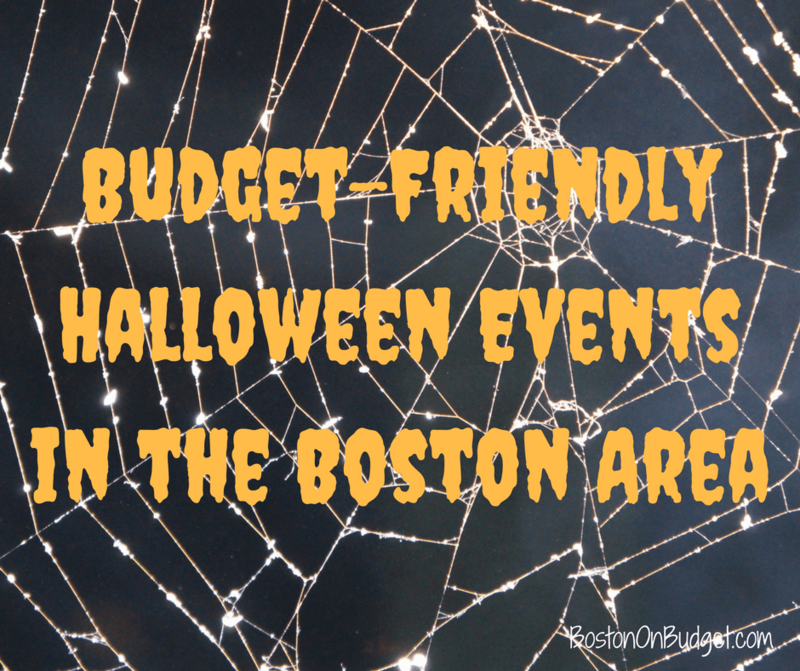 Are you looking for some budget-friendly or free Halloween events in the Greater Boston area? Here are a few fun events happening from now until October 31, 2017 that don’t cost too much! Pru Boo: October 29, 2017 from 11-1pm at the Prudential Center. Wear your cutest costume and trick or treat for charity. Face painting, kid concert, pumpkin decorating and more. $5 donation towards nonprofit partner. Halloween Happenings at CambridgeSide: October 30, 2017 from 4-6pm. Enjoy trick-or-treating and grabbing a bag of goodies at CambridgeSide. Please bring a canned good. Halloween Trick-or-Treat & Boo Bash: October 26, 2017 from 4:30-6:30pm at Legacy Place. Compete in a costume contest, enjoy trick-or-treating, partake in seasonal crafts and more at Legacy Place! Free, but please bring a non-perishable good for the Greater Boston Food Bank. Wally and Tessie’s Halloween Party: Saturday, October 28, 2017 from 11-2pm at Fenway Park. Trick-or-treat at the ballpark, paint mini pumpkins and enjoy other fall activities! Free and open to the public. Castle Island Halloween Celebration: October 28-29, 2017. Enjoy a fun day at Castle Island with a variety of fun Halloween activities! South Shore Plaza Boo Bash: October 29, 2017 from 1-3pm at the South Shore Plaza (Nordstrom wing) in Braintree. Come in costume and enjoy some fun and surprises! Free Halloween Event at Bass Pro Shops: October 27-31, 2017 at Bass Pro Shops. Enjoy Halloween events, crafts, and get free photos with their Great Pumpkin Celebration! Halloween Happenings at Westgate Mall: October 31, 2017 at 5pm at Westgate Mall in Brockton. Trick or treat at Westgate mall and enjoy a variety of Halloween activities! Pumpkin Palooza: Saturday, October 28, 2017 at The Lawn on D. Enjoy fun Halloween activities such as pumpkin carving, costume contest, train rides, and more! SoWa Spooktacular: Saturday, October 28-29, 2017 in the South End. Head to the last SoWa Open Market for the season with a big Halloween party! Halloween at Gibson House: October 31, 2017. Visit the spookiest house in the Back Bay for some trick-or-treating from 5:30-7pm. Halloween Boo Bash: Monday, October 30, 2017 from 5:30-7:30pm at the Derby Shoppes in Hingham. Enjoy live music, a haunted cemetery, photo booth, and more! North End Halloween Party & Parade: Saturday, October 28, 2017 from 1-3pm in the North End. Enjoy a parade through the North End + some Halloween fun! Family-Friendly Halloween Celebration: Tuesday, October 31, 2017 at the Mandarin Oriental. Enjoy a festive family-friendly Halloween Celebration in the hotel lobby with a kids costume contest, treats, and more! Boston Public Library Halloween Events: Check out your local Boston Library for fun Halloween events crafts, Halloween story time, movies, and more. BCYF Halloween Parties: Check out your local Boston community center for Halloween fun for youth! Hard Rock Boston’s Halloween Thriller Dance Party: Saturday, October 28, 2017 at the Hard Rock Café. Enjoy a fun Halloween party at the Hard Rock Café with free tickets via Goldstar Boston (affiliate link). Annual Dia de Los Muertos Celebration: Saturday, October 28, 2017 from 12-5pm at Taza Chocolate Factory Store in Somerville. Enjoy hot chocolate samples, crafts, face painting, music, and more at Taza Chocolate! Scary Face Pancakes at IHOP: October 31, 2017 from 7am-10pm. Kids can get free scary face pancakes at IHOP on Halloween! Boorito at Chipotle: October 31, 2017 from 3pm-Close at local Chipotle restaurants. Stop by your local Chopotle on Halloween night dressed in costume and score a boo-rito, bowl, salad, or tacos for $3. Halloween Pet Parade & Costume Contest: Saturday, October 28, 2017 from 12-4pm at Faneuil Hall Marketplace. Watch, enjoy, and possibly dress up your pet for this annual pet parade! Registration is required for costume contest. Howl-O-Ween Pet Party: Saturday, October 28, 2017 from 11-1pm at the Seaport Hotel. Mix and mingle with other pet owners and pets and enter the pet costume party! Free and open to the public. Salem Haunted Happenings: Events daily in Salem, Massachusetts. Is there a better place to celebrate Halloween than Salem, MA? Check out some great Haunted Happenings all month. 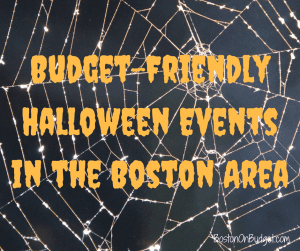 Please let me know I missed any fun and budget-friendly Halloween events in the Boston area soon!